The Benin Empire (1440-1897) was a pre-colonial African state of modern Nigeria. 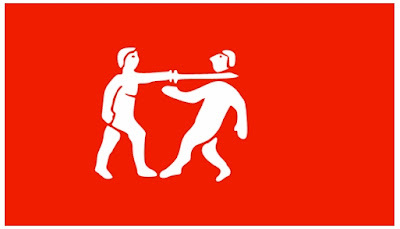 This was its flag. It depicts a man solemnly and very cleanly decapitating another man, who had just started to toprock. Remember: the citizens of Benin LOATHE b-boying. is this real? If so, where does one find such a thing? They weren't benign in Benin.